The move set off a rally in financial markets but it was unclear if the downward revision would be enough to satisfy the European Commission. The goal in the draft budget is now 2.4 percent of GDP, much higher than the 0.8 percent set by the previous government before it left office. The leaders of both parties in the coalition, which is composed of the right-wing League and the anti-establishment 5-Star Movement, signalled they were open to lowering the deficit goal ahead of a meeting on Monday to discuss the issue. The meeting, which a source said would be at 7:30 p.m. (1830 GMT), could lead to a breakthrough in the standoff with Brussels that has roiled financial markets concerned about the sustainability of Italy's massive debt and a prolonged fight with its European Union partners. Since presenting the draft budget two months ago, both coalition party leaders have repeatedly refused to budge on their spending plans. The European Commission has called for a reduction of the structural deficit that adjusts for the economic cycle and one-off measures. On Monday, League leader Matteo Salvini said Brussels had offered "positive feedback" on plans to lower the target. Italy's benchmark bond-yield spread over the German equivalent fell to its tightest level in more than a month at 279 basis points. The stock market rose more than 2 percent. Ahead of the crucial meeting, Prime Minister Giuseppe Conte said the coalition parties were united, but it remained unclear how spending would be reduced. One option under consideration, according to a parliamentary source, was delaying the implementation of the citizen's income and the planned increase in retirement age to April instead of February or March, which could save billions. Another possibility floated by the League's Armando Siri, a deputy transport minister, was to funnel the citizen's wage to businesses who hire and train the unemployed, a move that would probably limit outlays for state unemployment offices and training programmes. "5-Star is willing to talk about incentives for companies that hire workers who are receiving the citizen's income," 5-Star's Senate leader Stefano Patuanelli said. A meeting between Conte and European Commission President Jean-Claude Juncker on Saturday appeared to open the way to a softening of Italy's position. On Monday, the European Central Bank's chief economist, Peter Praet, said increasing borrowing costs would offset any of the possible economic advantages to hiking spending in breach of EU rules next year. Salvini on Sunday said "no one is stuck" to the 2.4 percent target. 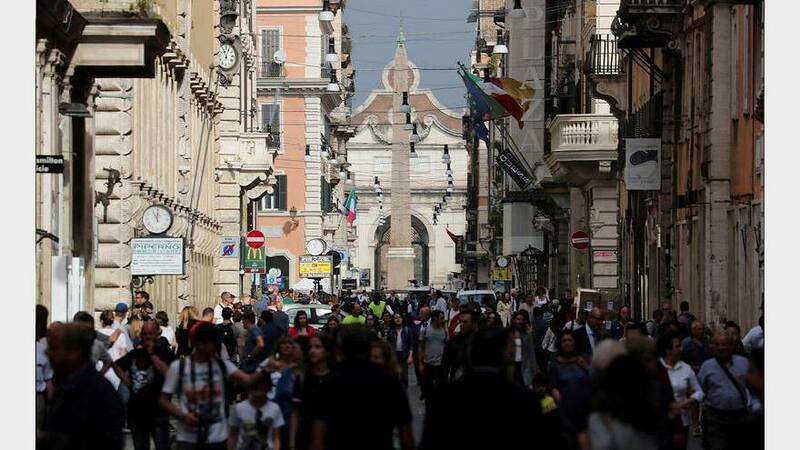 Deputy Prime Minister Luigi Di Maio, who heads the 5-Star, said as long as the measures in the budget remain unchanged, including the Movement's flagship citizen's income, then lowering the deficit goal was not a problem. "What is important is that the budget contains the goals that we have established," Di Maio said on Monday. "Then if the negotiation means that the deficit (target) must come down a bit, for us it's not important."